The Art Center is currently working on adding outdoor sculpture pieces. 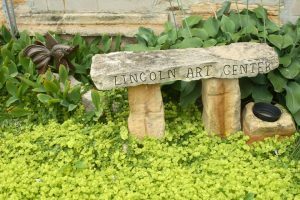 The first one was installed at the Lincoln County Courthouse grounds, and three more have been added to the art center garden. The Lincoln Public Art Collection began in 1986 with a purchase of a small oil painting by Charles Rogers of Ellsworth. The collection includes works by professional Kansas artists who are full time artists, teach art, exhibit works in galleries, and/or national and regional juried shows. New works added to the collection are purchased with funds donated by local civic groups, merchants and interested patrons. In 1986, Barbara Jarvis and Joyce Harlow were members of the Kansas Small Oil Painters based in Wichita, Kansas. They were at a meeting in Wichita when the President of the board was explaining the difficulty they were having acquiring patron purchase awards. Harlow volunteered to award a $500 patron purchase from Lincoln County. She came back to Lincoln and managed to raise a little more than $500, with which she and Jarvis went to the juried exhibit of small oil paintings to choose the first purchase. Harlow recalls it was more difficult than expected. “We knew it had to be a painting that would stand the test of time, there were many to choose from, but Charles Rogers work “Silver Fall Moon” kept drawing us back for another look,” said Harlow. The collection was housed at the Carnegie Library in Lincoln until the collection outgrew the space available. At that time, Sharron Hamilton and Harlow began looking for a gallery space in Lincoln. In 1992, Cynthia Morton, Hamilton and Harlow decided to form an Arts & Humanities Organization to run an art center that would have room to exhibit the collection. This was the start of the Lincoln Art Center and the exhibits and programs that now provide for the Lincoln community and surrounding area. Each year, one or two art works are added and several of the patrons have supported this project from the beginning. Jarvis and Harlow have worked together on this project over the years and have also included Bob Crangle, Ruth Moritz and Kris Heinze in the selection process. The Art Center is currently working on adding outdoor sculpture pieces. The first one was installed at the Lincoln County Courthouse grounds, and three more have been added to the art center garden. The Public Art Collection has now passed its 25th year and the Art Center its 20th year.